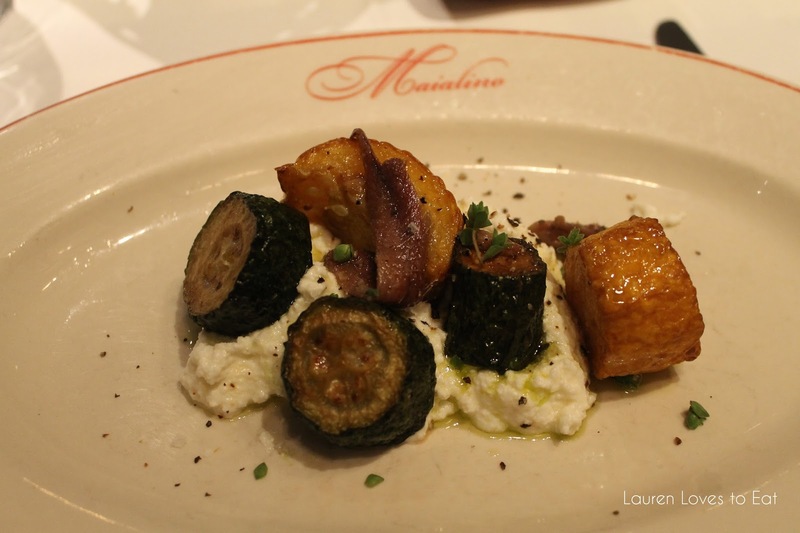 This is the third time I've visited Maialino during a NYC restaurant week, and it was a great experience yet again. 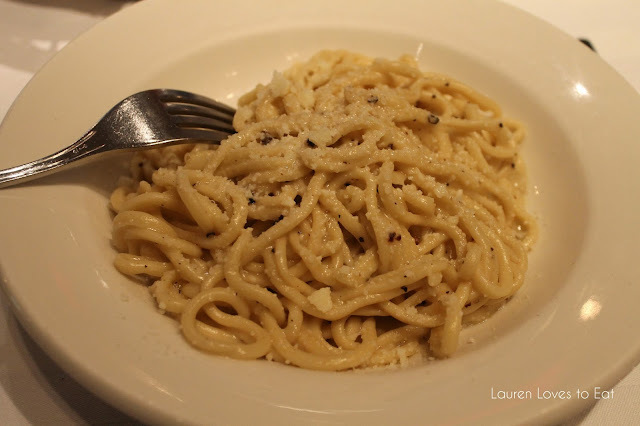 During my last visit earlier this year, I tried a chicken entree, but when I saw my friend order the beloved and famously good cacio e pepe tonnarelli, I was more than a little regretful about my choice. 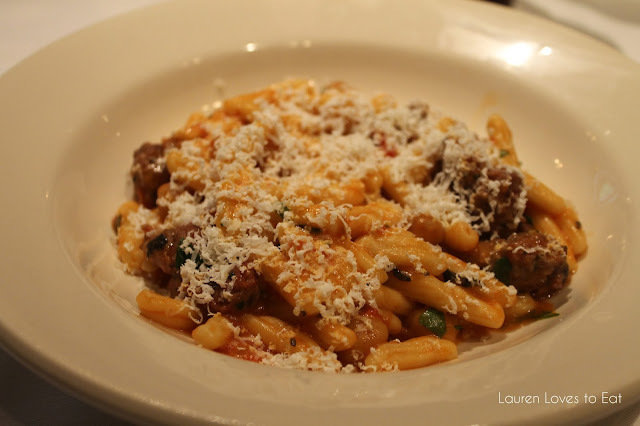 This time around, I didn't hesitate to get the pasta, and I was so satiated. 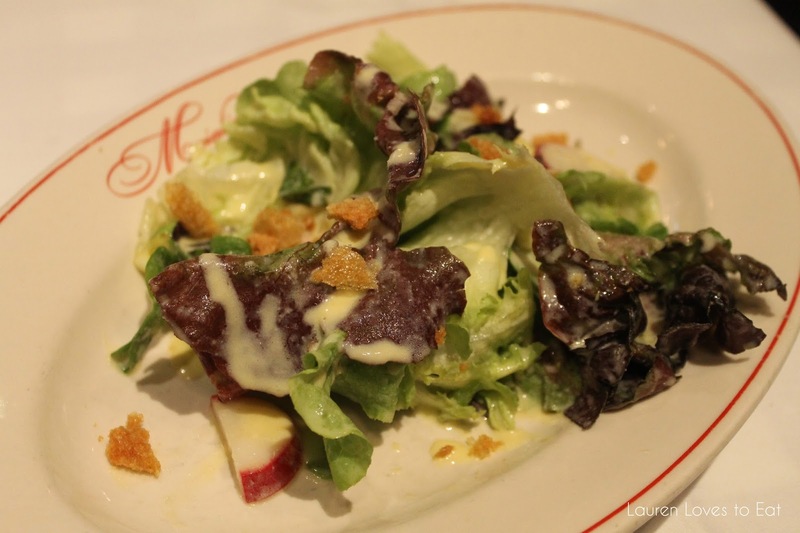 The restaurant week lunch menu is $25 for 3 courses, and at Maialino there is also a $35 option for a that includes lamb, steak, and braised suckling pig entrees. Since we were all interested in the pastas, we opted for the $25 menu. The restaurant has a lovely slightly rustic charm to it. The tables are nicely spaced out, so you don't feel like you're involved in multiple conversations as often is the case in New York City restaurants. 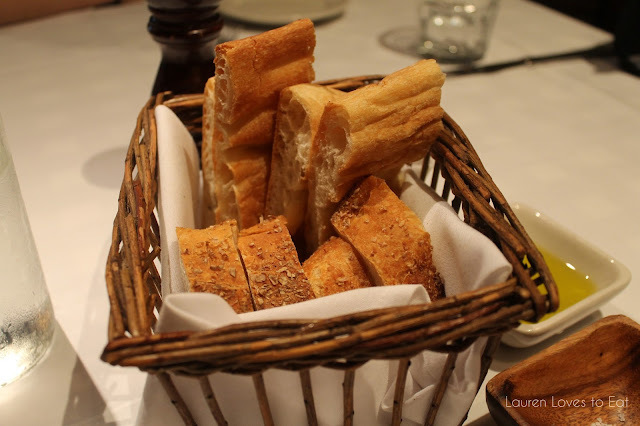 The best foccacia and strong olive oil. A great way to start the meal. 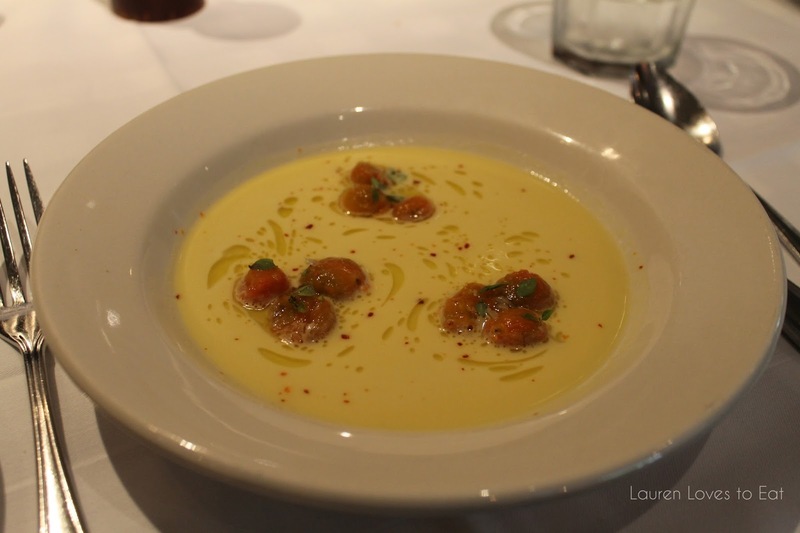 Chilled corn soup, basil, and cherry tomatoes. Our server told us that Maialino had actually just added this soup onto the restaurant week menu that day, and that it was simply delicious. A big thank you to my friend Summer for ordering this and letting us all try some. It is truly the most wonderful summer soup, with the perfect amount of sweetness, and a lovely similarity to cold Chinese pomelo tapioca desserts (mainly because of the temperature, smoothness, and sweet flavor). I liked that the soup wasn't too creamy, and that it had a very strong corn flavor, while it wasn't actually filled with corn kernels inside. Market lettuce, radishes, pork cracklings. Marinated summer squash, fresh ricotta, and sicilian anchovy filets. 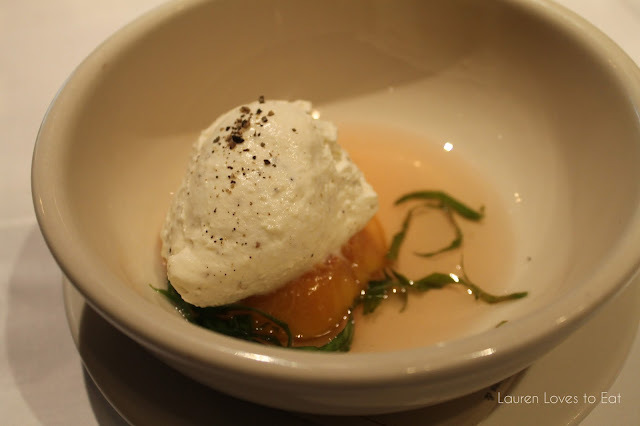 A terrific appetizer of semi-sweet squash complemented by the rich ricotta. Lamb sausage, tomato, rosemary and chickpea. 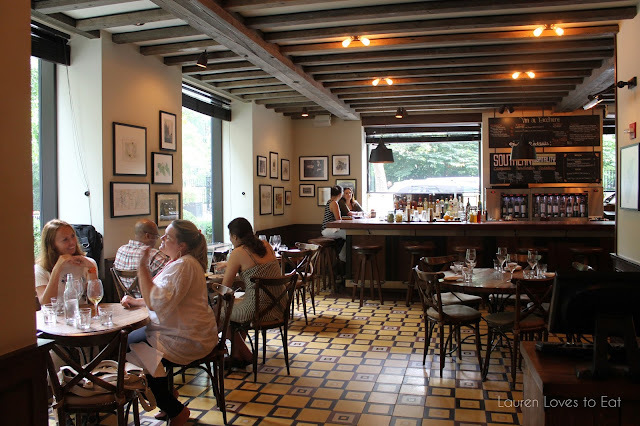 Maialino's house-made pasta is such a delight, these dishes are musts. Pecorino and black pepper. Although a combination of simple ingredients, this makes for an unforgettable pasta. The strong and borderline pungent cheese is absolutely superb. 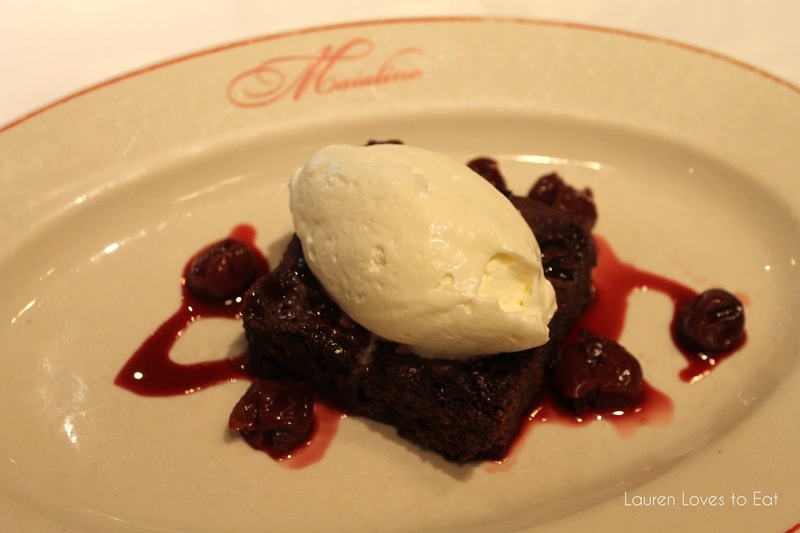 Chocolate cake and sour cherries. Warm and gooey in the middle, this cake could easily pass for a brownie. It is not to be missed. The sour cherries brought in a surprisingly perfect way to counteract the sweetness. 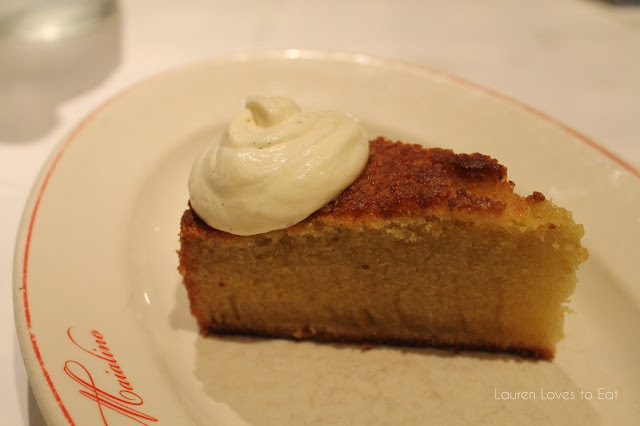 Olive oil cake and vanilla bean mascarpone. The one dessert I've ordered every time I've visited Maialino. It is a comforting dense slice of cake. The crust has a great texture to it and the vanilla bean mascarpone is not overly sweet. Roasted peaches and black pepper ricotta cream. If you haven't tried warm peaches before, this is your chance. As strange as the combination sounds, it went beautifully with the savory light ricotta cream.